Book Riot asked its contributors to choose some of its Best Books of 2013. The list is huge and covers an impressive range. Definitely worth checking out. Personally, I couldn't help but throwing in Unicorn Thinks He’s Pretty Great by Bob Shea. While I wouldn’t necessarily call this the best picture book of the year, it might be the most irresistible. And if the story of an insecure goat who is jealous of a talented newcomer sounds familiar, it’s probably because it is reminiscent of Milos Forman’s Amadeus. Here, Goat plays Salieri to Unicorn’s Mozart, only instead of conjuring beautiful symphonies from the heavens, Unicorn makes it rain cupcakes. Like I said: Irresistible. I recently got the chance to post my picks for Best Picture Books of 2013 on the Huffington Post. Believe it or not, more surprising that what made the list is how many great titles didn't make the cut... but I had to draw the line somewhere. Of at least that's what my editors tell me. 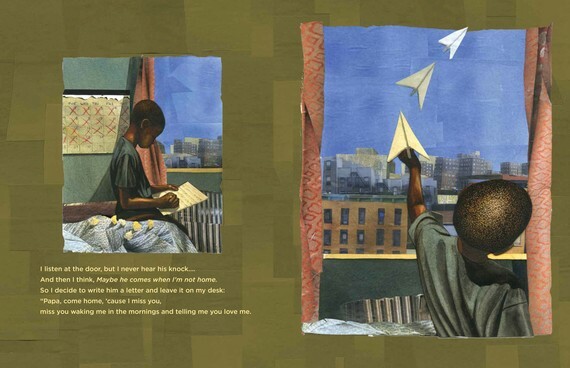 With everything from a sweeping biography of Nelson Mandela to a story about a unicorn that can make it rain cupcakes, 2013 was another great year for picture books. 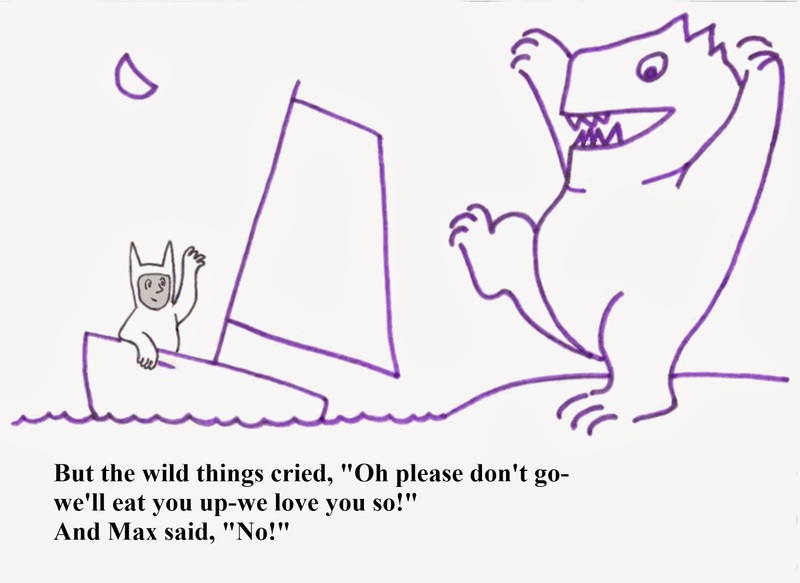 This is particularly notable because 2013 was the first full year after the death of the legendary Maurice Sendak and marked the 50th anniversary of his classic Where the Wild Things Are. 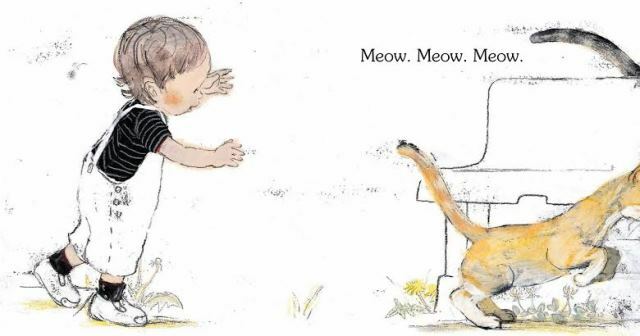 While it's impossible to replace an icon like Sendak, this year's offerings reminded us that the field of children's literature is still rich with talented writers and illustrators to carry on the tradition of making great picture books. Here are some of the year's best, starting with my choice for the Best Picture Book of 2013. 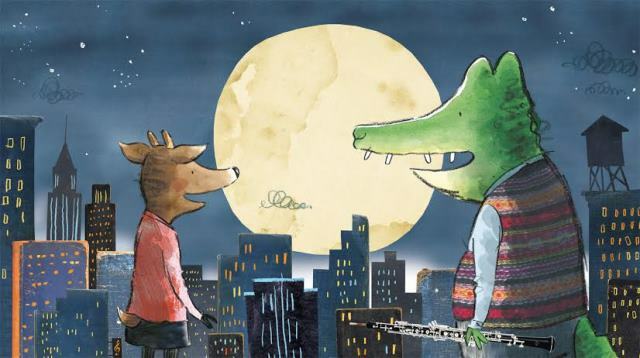 You wouldn't think that a story about a girl and her imaginary friend (a giant blue gorilla with a funky fashion sense and anger management issues) would feel like the most honest book of the year, but that's the magic of No Fits, Nilson!. Funny, boldly illustrated, and with a charming twist at the end, Nilson has universal appeal because everyone struggles to control their anger... even us so-called grown-ups. Like it or not, despite our best intentions, we're all just a few mishaps away from losing control of the thumping gorilla within. A rambunctious young boy imagines himself as a champion luchador, taking on challengers from all over the world (and some from beyond). 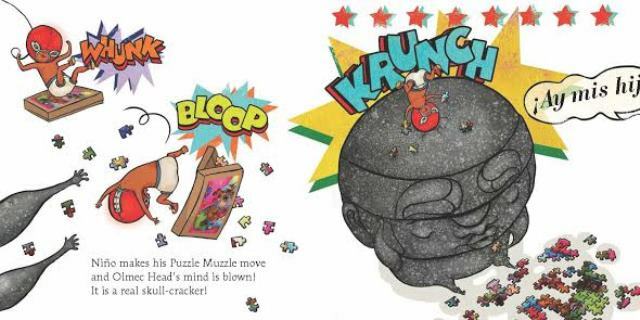 His enthusiasm is infectious as each page bursts with energy and playfully inventive wrestling moves. However, Morales truly flexes her illustrator muscles with the subtle complexity of Niño's expressions: knowingly impish grins that say "Of course, I know this is all make-believe... and I am enjoying every second of it". Based on Beaty's powerful spoken word and poetry, this is a touching story about a young boy struggling to piece together his identity using the fragmented memories of an absent father. This struggle is mirrored perfectly by the fragmented nature of Collier's collages, which are an inspired choice for illustration. Challenging but ultimately uplifting, Knock Knock is a thoughtful meditation on grappling with the sometimes uneasy legacy passed down to us by our parents. A child's first steps come with a mix of freedom and frustration (and a blend of joy and terror for the parent). With spare text and stark but lively illustrations, Wait! Wait! does a masterful job of capturing that magical window of time when a toddler first ventures clumsily out into the world. In the tradition of Woody Allen's Manhattan, this is less a love story about two people (or in this case, animals) and more a love song about life in New York City. Presented with a deft mix of illustration and collage, you want to live in Gordon's New York, which is sometimes moody and isolating, but always charming and teeming with possibility. Battle Bunny is the most talked about book of the year... or maybe it just seems that way because I've been talking about it all year. To create this innovative work, Scieszka, Barnett and Meyers started by producing the most cloyingly sweet book they could think of:Birthday Bunny. 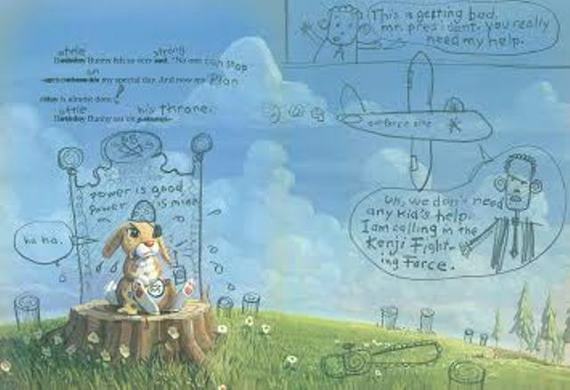 They then conjured up a young boy to deface the book, turning it into something he actually wants to read: Battle Bunny. Subversive without being mean-spirited, the book playfully upends the conventions of narrative. Just watch as they introduce a complex concept like authorial intent... and then gleefully give it an atomic wedgie. It's not often that a picture book can be described as "magisterial", but such is scope of Floca's achievement here. Starting with the breathtaking cover which has you staring down an oncoming locomotive, the book takes the reader on a cross-country trip during the early days of the steam train. The text is bolstered by exhaustive research, as evidenced by one of the most impressive bibliographies you'll ever see in a picture book. 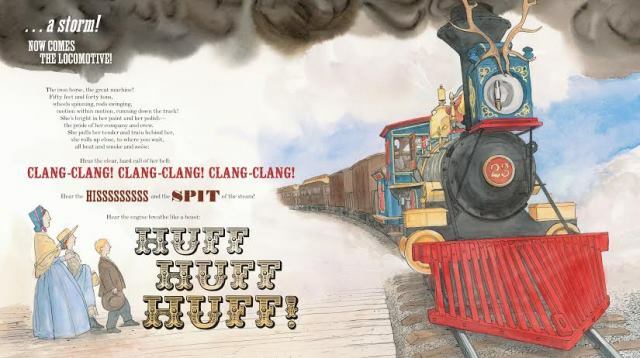 And yet, it is anything but dry due to its rhythmic tone (at times calling to mind the propulsive chug-a-chug-a-chug-a of a train) and illustrations so engaging you practically have to shake the sepia-toned dust out of your hair at the end of the ride. A truly effective bedtime book must strike a balance between two seemingly competing objectives: (1) setting a tone that is actually conducive to sleep and doesn't get the kids all riled up, and (2) being engaging and just interesting enough to bear repeated readings without driving the reader absolutely insane. Rock-a-bye Room hits the right notes on both fronts: it is warm but also has a bit of an edge, and it is sweet without giving you a toothache. With Bates' gorgeous illustrations, the book goes down like a warm glass of milk (followed shortly by a smooth glass of bourbon). At first glance, you might mistake Jumping Penguins for just another catalog of animal facts, probably no different than a set of flashcards you could pick up at a zoo gift shop. But then you notice Tolman's idiosyncratic illustrations and you realize that there's nothing typical about this book. Surreal, whimsical, and sometimes morbid, Jumping Penguinsdelights in reminding us just how wonderfully weird (or weirdly wonderful) the world can be. 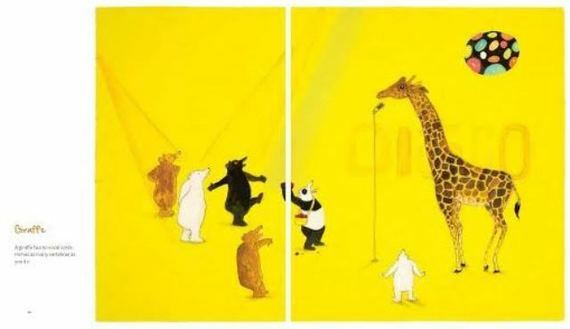 For instance, who knew giraffes had no vocal cords and would be so bad at karaoke? 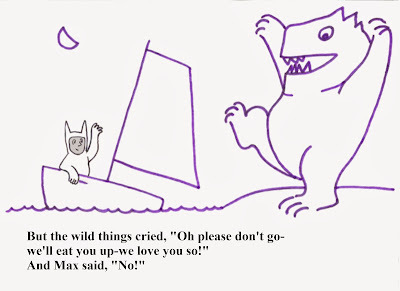 A while ago, Betsy Bird (she of the always ingenious ideas), put celebrate the 50th Anniversary of Where the Wild Things Are by putting a call out for people to reimagine Sendak classics in the style of other illustrators. Originally posted on Book Riot on November 18th. Everyone loves a good Serious Author Photo. Capturing writers in their natural habitat of intense concentration, brows furrowed in pensive fury, these august portraits let us readers know that it is time to set aside petty concerns and pay VERY. CLOSE. ATTENTION. But you can’t help but feel sorry for the poor soul in the Serious Author Photo. By honing in on one aspect of their personality, the picture airbrushes their very humanity out of the portrait. So we’ve decided to liberate a few from the dim mood lighting of the Serious Author Photo and shine a light on those traits that may otherwise never make it onto the dust jacket. Last week, when presented with the As I Lay Dying movie tie-in with James Franco on the cover, the internet let out a collective groan. On the one hand, the outrage is understandable. It is a pretty silly cover. On the other hand, is this really worthy of our righteous indignation? I say, instead of resisting we embrace the ridiculousness and put James Franco on ALL the book covers. Who’s with me? The Dating Wire: What If All Your Books Had James Franco On The Cover? One of my favorite things about picture books is there are so many design elements in play, offering tons of potential for fun little wrinkles. Exhibit A: Mr. Tiger Goes Wild. The awesomely illustrated book is about a tiger (Mr. Tiger) who is tired of being proper. He bucks social convention and sheds his suits to go au naturale. 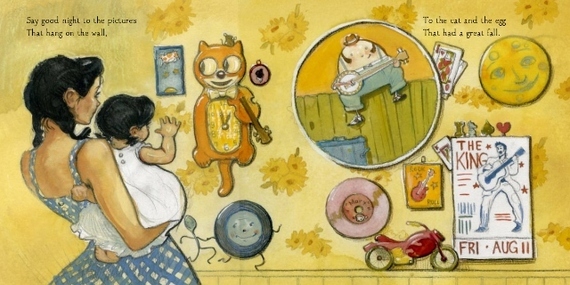 It's a fun and well-executed story and definitely a Caldecott frontrunner. If there is one thing that might put it over the top, it is this ingenious book design that playfully captures spirit of the book. That might be the most perfect use of the dust jacket I have ever seen. The physical act of taking off the dust jacket reveals the tiger's bare skin to cleverly mirror the story--a brilliant design. Bravo. If a novel starring a used bookshop clerk and a children’s author doesn’t set off your bookish spidey-sense, I don’t know what will. Hoban (himself the renowned children’s author of Bread and Jam for Frances and others) tells this funny but restrained story about two kindred spirits drawn together by sea turtles in the local zoo. Unable to shake the thought that caged life is keeping the turtles from their greater purpose, the two hatch a plot to return the creatures to their natural habitat. Perhaps foolishly, the two harbor a secret hope that releasing the turtles will also somehow offer an escape from their own lives of quiet desperation. Originally published in the seventies and recently reissued by the New York Review of Books, the premise may sound a tad hokey, but Hoban is a skillful observer of human nature and draws convincing portraits of two people desperate to find purpose amidst the monotony of modern life. This week I had the opportunity to write a picture book preview for the Atlantic Wire. Luckily for me, there is an incredible slate of books coming out in the next couple of months, so the challenge was really narrowing it down to a digestible list. Please CLICK HERE to read the full article at the Atlantic Wire. The article was kind of aimed toward a broader audience, many of whom might not normally think about children's books. Which means I didn't go into too much depth. Over the next little bit I might dive in a little deeper for the kidlit aficionados out there, but in the meantime, here is a list (in alphabetical order) of the books that I included, all of which are worth your time and then some. This post originally appeared on Book Riot. It seems like every couple months I see a post go around about Amazon one-star reviews of classic books. Recently there was Buzzfeed’s Depressing One Star Reviews of Classic Literature and earlier this year Book Riot’s own Johann Thorsson compiled some doozies in his post on One-Star Reviews of Beloved Books. Keep ‘em coming, internet. They never disappoint. Inspired by Jimmy Kimmel’s always funny Celebrities Read Mean Tweets, I thought it’d be fun to imagine these authors reading their own one-star reviews. Sticks and stones may break your bones, but a bad review can really sting, man. As a newish father, it sometimes feels like the only organizing principle of my world is the alphabet. From books to blocks to magnets to soup, the alphabet has imposed its will and everything around me now automatically categorizes itself, shuffling obediently into its proper place in this efficient 26 character system. With the alphabet on the brain (seriously, C is for Cookie is playing in my head as I type this) I thought this would be a fun question to throw out to the book-loving community: Who makes it onto your Author Alphabet? You can use whatever criteria you want. It could be based on first or last name (or with tricky letters like Q and X, just do whatever the heck you need to do). It can have authors you love or ones that you loathe. You can have read their entire works or have never read a single word. You can try to make your alphabet diverse and representative, or you can fill it exclusively with female authors from the Mississippi Delta. You get the idea. Anything goes. Now that we’ve established the ground rules (or lack thereof), I’d like to hear from you all: Who makes it onto your Author Alphabet? With Kyle’s permission, we took his idea and ran with it (pun unfortunately intended). So, without any further ado, here is Runaway Bunny starring Liam Neeson (screenplay by Margaret Wise Brown). 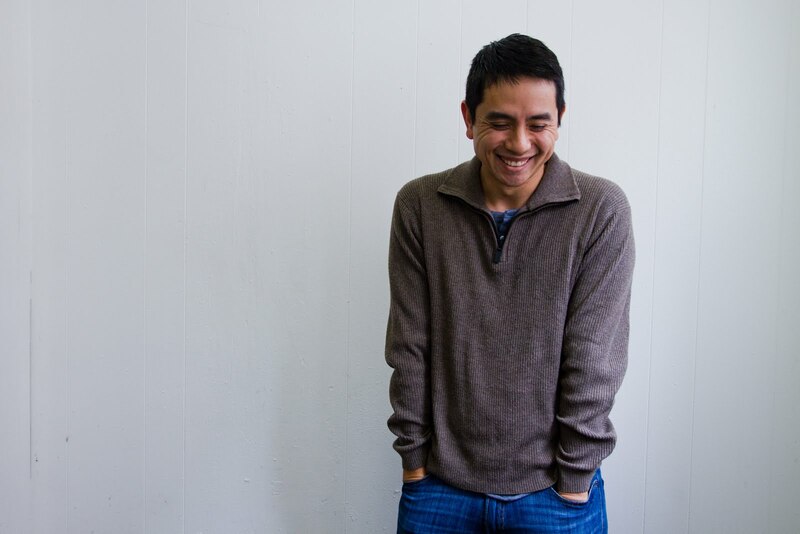 Guest collaborator Kyle is a human factors psychologist by day, and as the father of a two year old and an eight month old, a children’s book reading machine at night. He has been chronicling the crazy thoughts that pop into his head while reading Goodnight Moon for the 5507th time at writingboutreading.blogspot.com. When not reading, he enjoys traveling the world with his wife on a quest to find the best bite of food and offsetting this hobby by training for both adventure and endurance races.